Bowie dog bite lawyer, Maria Patterson, handles dog bite cases and other injuries caused by dogs in Prince George’s County. Pet owners may be liable for injuries caused by dog bites, dogs chasing people or pets knocking people over. Patterson law has helped dog bite clients recover from everything from post-traumatic stress disorder to keloid scars. Patterson Law has guided clients as varied as a lady recovering from a neck surgery that was knocked over by a “friendly” dog to an NFL prospect who had his career ended by a pit bull attack through the recovery process. The laws governing dog owners have continued to evolve in Maryland and in particular, Prince George’s County. The Maryland Court of Appeals recently imposed strict liability for Pit Bull Terrier owners and land owners with the ability to control pit bulls on their property. This is a dramatic change in the law. In the case of Tracey v. Solesky, the parents of a child attacked by a pit bull owned by the landlord’s tenant sued the landlord. Animal attack and dog bite cases in Maryland prior to the April 26, 2012 decision required plaintiffs to establish that the owner or landlord knew or should have known that the particular animal was dangerous. The defendant knew or had reason to know that the dog was a pit bull or a pit bull mix. Please call 301-383-1522 for dog bite lawyer Maria Patterson to schedule a free consultation. Patterson Law’s offices are located in Bowie, Maryland. In most jurisdictions there are statutes that require animal owners to take steps to keep their dogs under control. These statutes are often referred to as leash laws. A violation of a leash law that leads to an injury can form the basis for holding a dog owner liable for a dog bite. In Prince George’s County, pit bull owners are subject to several statutory restrictions including, that a pit bull must be kept on a leash or in an enclosure at all times. This led to a Prince George’s County Court holding a pit bull owner liable for the injuries sustained by a twelve year old that was chased into the path of a car by an unleashed pit bull. Dogs that are unleashed on their owner’s property are not “roaming at large” in violation of the Prince George’s County leash law. Dog bite lawyer George Patterson has represented clients that have been injured by dogs that were not kept on a leash as required by local ordinances. Maria and George Patterson have successfully pursued cases against dog owners that knew their dogs could jump over or crawl under the fences in their yard. A dog owner may be liable for injuries caused by their dog, if the owner failed to exercise reasonable control over the animal or failed to prevent the harm caused by the dog. Negligence claims often rest on the owner’s knowledge that the dog posed a danger to the public. The reasonableness of the control exercised by the owner depends on what the owner knew or should have known about the danger posed by the dog. A history of a dog bite or dog attack will demand a high degree of control. The control required of a dog that has bit other people or chased other people is changed based on the history. A dog owner still has a responsibility to exercise control over even the most docile dog. The failure to comply with leash laws for a dog that has never exhibited any signs of aggression can still form the basis for a successful claim against the dog owner if that dog injures or bites a person. Please call 301-383-1522 to schedule a free consultation with a Bowie dog bite lawyer at Patterson Law. A Kangal has nearly 3 times the bite force as an American Pit Bull. Kangals were originally domesticated to protect sheep from bears, jackals and wolves. George Patterson has represented several delivery drivers that have been attacked by dogs or suffered dog bites. Whether the person worked for Fed Ex, United Parcel Service, DHL or the United States Postal Service they all receive training whether informal or formal about delivery packages to properties with dogs. Many of attorney George Patterson’s clients have gone decades without ever being bit by a dog despite daily encounters. A delivery person develops a unique set of skills to identify dangerous situations and to navigate those situations as carefully as possible. The most common scenario is an owner that opens the front door to receive a package and fails to restrain an unleashed dog that breaks free and attacks the delivery person. Sometimes a dog is left in the custody of a young child or friend that simply does not have the strength to control the dog or the ability to verbally command a dog. It is negligent for the owner of a 120 lb dog to permit a 60 lb child to walk the dog on a leash. If the child is unable to restrain the dog, the owner has not complied with the spirit and intent of the applicable leash law. Despite years of experience encountering dogs, a delivery person will occasionally encounter an improperly restrained dog that they are unable to avoid. Typically, if a delivery person is attacked by a dog the fault almost always rests with the dog owner. For other incidents involving breeds including Rottweilers, German Shepards, Akitas, and Doberman Pinchers, a plaintiff must establish that the defendant knew or should have known that the particular animal was dangerous. It only needs to be shown that the owner knew or should have known of the dog’s propensity for the type of mischief that led to the injury. Evidence of a prior dog bite or dog attack is compelling evidence. For example, an owner that knew his dog often chased people on bikes would be liable for the injuries sustained by a bicyclist that crashed as a result of being chased by the dog. On the other hand, the owner of this particular dog may not be liable if the dog unexpectedly bit a child that went to pet the dog. A dog bite lawyer at Patterson Law is available for a free consultation to assess whether you may have a dog bite injury claim. George won my case because he is an awesome and knowledgeable lawyer, who genuinely cares. A dog will guard its owner but that owner owes a duty to guard the public from his dog. 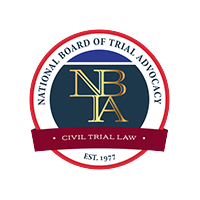 George Patterson is a board certified civil trial attorney by the NBTA. The Supreme Court of the United States recognizes this meaningful certification. The Bowie dog bite Lawyers at Patterson Law serve clients in Prince George's County and throughout Maryland. Patterson Law is located near the intersection of Route 301 and Route 50 in Bowie, Maryland. If you or a loved one has been injured by a pit bull or other dangerous animal please contact a Bowie dog bite lawyer at Patterson Law at 301-383-1522 for a free consultation. A Prince George's County dog bite lawyer is available to meet you at Patterson Law located in Bowie, Maryland near the intersection of Route 301 and Route 50.